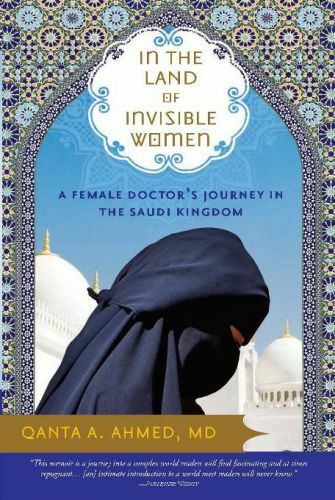 Dr. Qanta Ahmed is the author of In the Land of Invisible Women: A Female Doctor’s Journey in the Saudi Kingdom. She is a Muslim woman born in the United Kingdom to Pakistani parents and is a widely-published anti-Islamist Muslim. You can follow her at Twitter.com/MissDiagnosis. Ryan Mauro: What made you decide to struggle against the Islamist ideology? Qanta Ahmed: In the years since 9-11, every Muslim has been compelled to confront his or her identity. Matters were brought into particularly sharp relief for me on that day, because I was in Riyadh, Saudi Arabia, when the Towers fell. Within hours, I discovered my sentiments of loss and sorrow were not widely shared, either by Saudi colleagues or by fellow Muslim expatriate workers, many of whom had been trained in New York City like myself. This came as a terrible shock to my Pollyanna naiveties at the time. I realized the version of Islam my parents had given to me wasn’t widely accepted. Our faith always centered on pluralism, deep reverence for other monotheisms and an acknowledgement of our beliefs as Muslims to have been informed by the believers preceding Islam, as the Quran explicitly acknowledges. Nothing could be more offensive to my beliefs as a Muslim or my principles as a human being. This was extraordinarily difficult to reconcile with the knowledge that Islam condemns murder and particularly the execution of non-combatant civilians in any setting. In my mind, Bin Laden and his sympathizers had renounced Islam by their acts and represented nothing more than violent terrorists. On my return from Saudi Arabia, I began to record my experiences in a manuscript that would become my first book. Realizing I would be representing two versions of Islam- mine, and that espoused by the Sunni Wahabi theocracy of Saudi Arabia, I needed to broaden my reading around key areas. It was in my reading that I discovered the political ideology termed Islamism, and the many strains of contemporary radical Islam, both violent and non-violent. I learned, unlike my own experience, many Muslims struggled with a pervasive sense of inferiority influencing all their beliefs, sense of justice and identities leading to deep and rather novel resentments. The fascist supremacy of Islamist ideologues was therefore a predictably appealing, if very frightening development, which, to my perspective was completely alien to the Islam I knew. Over time, the Islamist voice has become increasingly prominent, whether in advancing the intrusion of ritual symbolism of Islam into the public space – for instance the battle for the niqab(veil) in the public arena in France, the demands for the veil to be permitted in FIFA soccer tournaments, or the most recent debacle involving the vilification of the NYPD for their counter terrorism efforts with false accusations of Muslim profiling. Pakistan, the country of my parental heritage, is especially disturbing because Islamists are in full control of the constitution, judiciary and public discourse, resulting in some of the worst abuses against minorities anywhere in the world. Throughout the world, the Islamists’ goal is one and the same: To stoke the fires of unwitting Muslims into believing in their own manufactured sense of victimhood as a means to exploit both the uninformed Muslim and often times the liberal democracies where we make our homes. Claiming persecution, discrimination, profiling or victimization, liberal democracies are pressured in relinquishing not only their own sense of identity but also significant concessions in a shared public space which truly belongs to everyone, irrespective of faith and not merely the “victimized” Muslim. It is this last fallacy of collective victimhood that most fuels my drive to expose Islamism for what it is – a weak, yet vicious, imposter for a great religion; an imposter which seeks to exploit and devour both Muslims and non-Muslims in its pursuit for power and dominance. Mauro: Do you feel that groups like CAIR (Council on American Islamic Relations) and ISNA (Islamic Society of North America) are helping your cause? Ahmed: I have no contact with these groups and can only draw conclusions based on the public record, which would indicate their sympathies are very much with the Islamist camp. If anything, these organizations seek to drown out the complex, heterogeneous and multifaceted community of Muslims in America because their goal is to promote a unified sense of disadvantage and debasement of Muslim Americans, when, in fact, demographic data points in exactly the opposite direction. Muslims in America are more economically mobile than anywhere else in the world, making it very hard to equate this reality with a fantasy of a disadvantaged, marginalized American minority. Mauro: You wrote an editorial defending the NYPD’s counter-terrorism practices. How has the Muslim-American community responded to your activism? Ahmed: I have come across no cogent or public response from the Muslim American community, though I have been acknowledged by lawmakers and members of the NYPD. Nor do I seek a particular response from the Muslim American community. I am fortunate to have the opportunity to flex a public voice when the need arises. This has been a direct gift of my time and privilege in America for which I am very grateful. My defense of the NYPD is rooted in Islamic principles which demand every Muslim meet his duty to his society, its protection, cohesion and enhancement. I wrote about this in the WallStreet Journal at some length. Unfairly vilifying the NYPD in the way the Associated Pressreports have, published without balanced context or true expert analysis, has been enormously destructive to post 9-11 New York. Reckless accusations like this do much more harm than advocacy. In my practice as a physician, I am honored to attend to a great many law enforcement officials, whether the NYPD policeman on patrol, commanders operating counter terrorism taskforces, federal bureau officials, or many other experts. Understanding their work and the toll it takes on them makes clear to me the enormous sacrifice they and their families make to safeguard us at times of crisis and in between. We cannot tear these institutions (which the public likes to forget are made of individuals) in this fashion. That is the height of ingratitude and ignorance. Mauro: Do you think the Arab Spring is coming to Saudi Arabia? And, if so, when? Ahmed: No. And there are many reasons for this which I have previously published elsewhere, but in sum, the Spring will not come there because of the relative economic security of being a Saudi in the Kingdom, the complacency of the Saudi public inured to theocracy, the perceived benevolence of King Abdullah, who is an extremely popular monarch among the Saudis and the relative power of their economy. Also, political reforms are being made at an incremental, if slow, pace and this breeds hope and optimism among the Saudis. While it may be appealing to hope for an Arab Spring, this scale of upheaval in the Saudi Kingdom could be extraordinarily destabilizing for the whole region and could potentially pave the way for radical Islamists to assume power -- a very unlikely scenario but undesirable for everyone everywhere today. Mauro: As a Muslim, how do you argue theologically against the Islamists? Ahmed: Very simply, Islam is nothing if not justice. Any injustice committed or pursued in the name of Islam is anathema to the believing Muslim and counter to the ideal which is Islam. Muslims must remember their duty not only to themselves or their Maker but also to their society wherever they find themselves. The Prophet Mohammed (SAW) himself admonished his followers not to make claims of supremacy over Moses, or indeed any other messenger of God. The Qur’an repeatedly reminds the Muslim that “to each is sent a Law and a Way” and to each they must “judge themselves by their Law and their Way.” Islamist Muslims overlook this. Our role as believers is to cooperate and collaborate and enhance the world, not to oppress, discriminate, exclude or persecute others. Major Muslim democracies around the world, foremost Pakistan and Indonesia, have departed from these foundational principles and, in doing so, have renounced their rights to call themselves Islamic. They are operating as Islamist Supremacists who legally persecute Muslim and non-Muslim minorities to extinction through execution and do so with impunity. Worse, they seek to propagate extraordinary vicious Blasphemy Laws into the wider field of international law through the Organization of the Islamic Conference, seeking to confine and then suffocate free speech, which, along with free press, is the bulwark of any vibrant democracy. These are not the ways of Muslims. These are the ways of fascists. “Whoever sees a wrong and is able to put it right with his hand, let him do so; if he can’t, then with his tongue, if he can’t, then with his heart. That is the bare minimum of faith.” Thus, having hand, tongue, and heart, I am committed to I live by this. Ryan Mauro is RadicalIslam.org's National Security Analyst and a fellow with the Clarion Fund. He is the founder of WorldThreats.com and is frequently interviewed on Fox News. All this is nothing but her screaming to the world that Islam is being hijacked, thus still a victim then, nevertheless. Dr. Qanta, if you can read me, please just leave Islam, you can't pick a turd by its clean end.